My Second Book – Scraps Plus One! My Book – Cut the Scraps! What is a Snap Sack Kit? Quilters can be very frugal. We love fabric! We sew for hours and hours to create beautiful quilts, pillows, baby blankets, and more. And we save the pieces that are left after the project is complete. In random clumps and sizes squished together to use later. . . In bags, boxes, drawers, closets, car trunks, . . . well, it’s everywhere! And we feel guilty as the scrap fabric stash grows. ‘Some day, I’m going to make a scrappy quilt with all this,” you say. But, where to begin. The task seems daunting. Perhaps you need a plan. Perhaps you need ScrapTherapy! ScrapTherapy, Cut the Scraps! from The Taunton Press is available now! Everything you ever wanted to know about the ScrapTherapy process is included in this all-encompassing book! 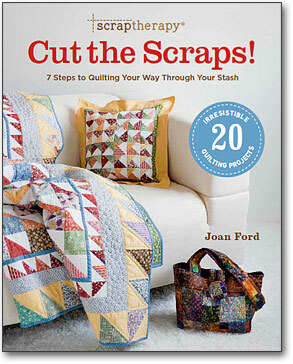 Make beautiful scrappy projects like quilts, bags and more, with your own scrap fabric leftovers. Beautiful photos and illustrations take you step-by-step through the process, to cut, store, and, most importantly, USE your fabric leftovers. It’s easy. It’s fun. And it makes perfect sense! The ScrapTherapy program is a two-part process described in detail on all three of my ScrapTherapy-themed books. It is a proven system to organize and use fabric scraps. Cut the Scraps! Unruly scraps are cut into squares in three sensible sizes, then stored in special see-though storage bins for easy access. So, when it’s time to sew, you are ready to roll up your sleeves and get started! Quilted projects use the newly-cut and organized fabric pieces in a variety of fresh patterns and projects. 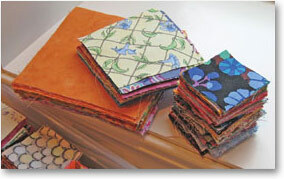 Watch your scrap stack shrink while converting scrap fabrics into usable quilts, table runners, bags and more! Find ScrapTherapy books and patterns HERE or ask for them at your favorite independent quilt shop or find them here. To stay on top of the lastest news, ScrapTherapy quilt pattern updates, tips and stories, fill in your email address in the space in the sidebar to receive the weekly eNews, “Good Migrations.” You’ll receive a FREE special downloadable pattern as a ‘thank you’ for signing up! Subscribe to the no-obligation newsletter for the latest breaking news on new patterns and tips. For this newsletter, Retailers only, please! In addition, you'll receive "Good Migrations" eNews each week! Copyright © 2019 by Joan Ford · Website design by Holly Knott LLC.